Breast cancer is the second most common cancer in women in the U.S. Fortunately, deaths caused by breast cancer have declined over the past 20 years, in part, because of improved screenings and treatment techniques. 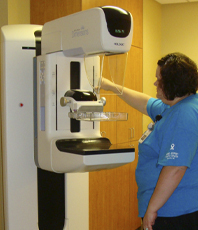 Mammograms are the preferred diagnostic test that can find breast cancer in its early stages. For many years, the only option was mammograms that record images of the breasts on film. Digital mammography enables radiologists to better diagnose cancers that may not have been detected with film mammography. Digital technology can be used to enhance and identify questionable areas within the image without requiring the patient to come back for additional studies. Please contact your health care provider or Annie Jeffrey Health Center at 402-747-2031 for more information or to make an appointment with this cancer screening machine.